At the first race of the season, Perthshire Police woman, Tracey Thomas, told us she would like to compete in the SDAS ladies’ CaniX class. Look at the results! 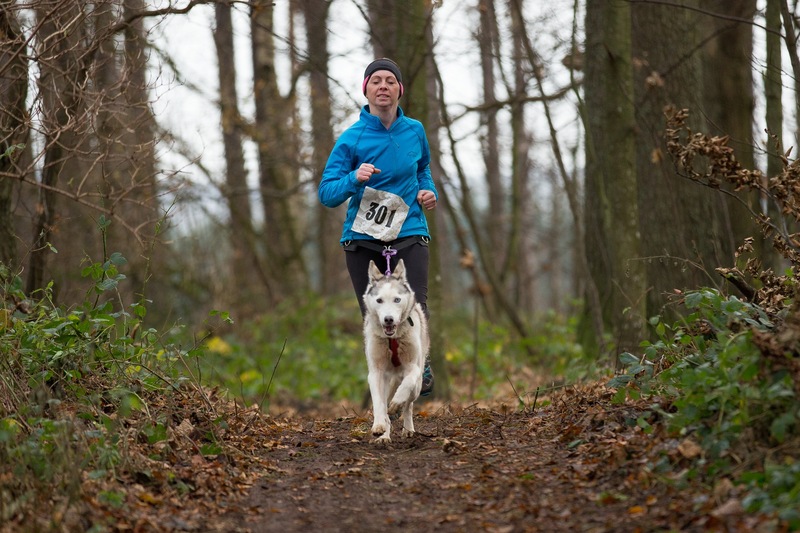 A keen runner, Tracey can often be seen exercising her own Siberian huskies and keeping fit herself, CaniXing with her boys individually around the various forests in the Tay Forest District. Tracey’s only dilemma was that she needed another dog to run with, as she was hoping to compete at SDAS all season with her 3 boys for the first time, in the 3 dog class. We had the perfect candidate to lend to Tracey, our super fit OAP, Satanta’s Oxygen, (AKA Oxi). Though Oxi had never cani-crossed in her life, we hoped that her amazing non-stop sled dog attitude would transfer to the new sport. With her daily dose of Get Over! Herbs added to her CP30 she can still hold her own in harness, albeit a touch slower now at her ripe old age of 11 years! First attempt was in fact at the SDAS National Championships at Ford Estate. After a slightly shaky start, while Oxi got used to the sound of Tracey’s pounding feet behind her, they CaniXed their way over frozen ground on day one and through rain and mud on ‘day two’, to take a well deserved Bronze medal against some world class competition! Tracey went on to complete the SDAS CSJ Championship series with Oxi. At their last race at Tracey’s usual stomping ground, Tentsmuir forest, Fife, they then went on to be awarded Joint Gold in the SDAS CSJ Championship for Womens CaniX. A big thank you to CSJ for providing Oxi with the nutrition she needs to keep doing what she lives for, and congratulations and thanks to Tracey for keeping an old girl happy at the races this year! We’re happy to announce that we’re sponsoring John Hilmer Hansen from HP Hundefoder, top breeder in Denmark, who uses CP 21 or CP 30 to feed his winning Münsterländers. John started in 1977 with his first dog, Ari, a male dog, then decided to get another male and female and start breeding. He won his first field test in 1993 in the highest category ‘Class for winners’ where he as placed no. 6. Two year later, he won a 4th place with his second female. John bought a new female, Birka, from one of the top breeders in germany. Then an accident to his Achilles tendon took John 2½ year to recover. Today John has Freya, who has became a DKCH (show) and a highly prized DKJCH (Danish Hunting Champ). John also has Heiki, who has has won absolutely everything in Denmark. She is the highest winning continental dog in Denmark ever. She is a DKCH, DKJCH and a DKBRCH. John also has Nesko, a male dog, with excellent skills and is expecting a great 2013 for him.